Indian Space Research Organisation (ISRO) Career Jobs Opening 2018 2019 Various Media Advisor Job Posts Download Application at www.isro.org Indian Space Research Organisation (ISRO)Career Job has Recently Announced 2018 regarding Media Advisor & Various Job Openings Interested and Eligible Candidates can Download Application Through Official website. 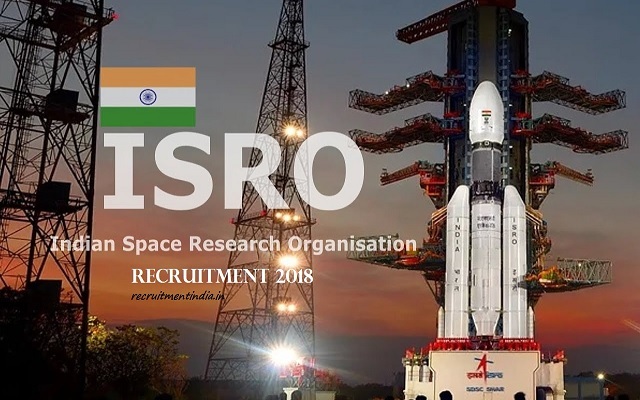 ISRO Recruitment 2018 @ Across India - Apply Online. Space activities in the country started during early 1960s with the scientific investigation of upper atmosphere and ionosphere over the magnetic equator that passes over Thumba near Thiruvananthapuram using small sounding rockets Realising the immense potential of space technology for national development, Dr. Vikram Sarabhai, the visionary leader envisioned that this powerful technology could play a meaningful role in national development and solving the problems of common man. Thus, Indian Space programme born in the church beginning, space activities in the country, concentrated on achieving self reliance and developing capability to build and launch communication satellites for television broadcast, telecommunications and meteorological applications; remote sensing satellites for management of natural resources. Qualification: Persons having Master’s Degree in Communication and Journalism (MCJ). Any higher qualification is desirable. Experience: Minimum 15 years of experience in the print/electronic media. i) The initial term of engagement shall be for a period of one year and likely to be extended by one more year on mutual consent. ii) The engagement of Consultant would be on full time basis and the incumbent would not be permitted to take up any other assignment during the period of Consultancy with the DOS/ISRO. The Consultant will have flexi working hours on all days but he will have to work for a minimum fixed time on each day. However, he should be available for all meetings and consultations mandatorily if called for with short notice. iii) The engagement of Consultant is purely of a temporary (nonofficial) nature and the appointment can be curtailed or terminated with one month notice on both sides. Age Limit: The maximum age limit for the post of Consultant shall be 50 years.Entitlements:The maximum amount of consolidated monthly remuneration payable would be Rs.75,000/-. The last date for receipt of application is 15 days from the date of publication of this advertisement in the ISRO website. The duly filled-in application with supporting documents shall be sent to Scientific Secretary, Indian Space Research Organisation, Headquarters(ISRO HQ), Antariksh Bhavan, New B.E.L Road, Bangalore - 560094, super scribing on the cover “ Application for the post of Consultant”.